How often have you run into a leader who’s been successful at guiding others by saying one thing and then doing something different? Not very often, right? That’s simply because it doesn’t work! It’s highly likely that principles taught without the right examples being put into practice will eventually fall by the wayside. Especially if you’re in a position of authority, it is of utmost importance to lead by example if you expect to gain compliance. Support of the principles based on results. For example, if you’re teaching honesty, when people see for themselves that you gain the trust of others by being honest, they will likely see the benefits of being honest themselves. Full understanding of the principles. Just imparting principles to others isn’t always enough. In fact, the majority of people may have a completely different understanding of what’s expected of them. Cohesion and cooperation. This is particularly true whenever team effort is required. When everybody is on the same page, processes, departments and families run more cohesively. Respect. When others can see that you are fully complying with the principles you teach, you’ll ultimately gain their respect. So what happens when you try to teach certain life principles but allow your actions to dictate otherwise? Those you expect compliance from will very soon grow to resent you, especially if the principles you’re teaching are a challenge for them to perform. You may end up with a negative reputation as an ineffective leader or teacher as you lose sight of the very actions you teach. Cases of rebellion will continue to grow as more and more people feel they’re being dictated to instead of led. It’s very easy to outline your expectations; it’s the simplest part of the equation. And that’s a start, because at least you know what the principles are. As they say, “Knowing is half the battle” but in this case, it’s the smaller half! Start small and stick to your immediate circle of influence. Give yourself the opportunity to impart morals and good belief systems on your immediate family and close friends. Tackle each principle one at a time. Work hard at allowing it to become an integral part of your everyday life. Once you’ve mastered one, move on to something else. However, it’s important to be able to give testimony to the fact that there are actually greater benefits to adhering to that particular principle than not adhering. There is an element of fulfillment when you can show others just what kind of actions, thoughts and behaviors contribute to a better, more wholesome outcome. 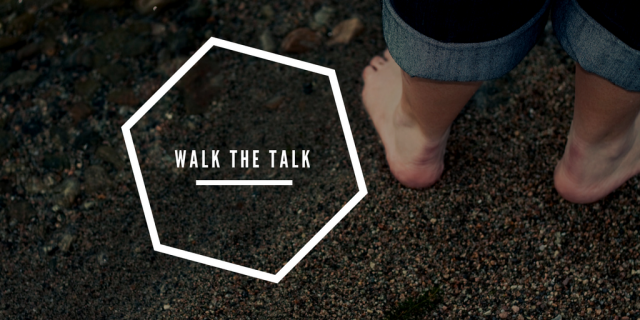 Walking the talk is a lifelong journey. There may be times that you’ll fall below your own expectations and the principles you aspire to uphold. However, what’s important is that you recognize it and take the necessary steps to get back on track! I think that everyone has a goal, a number of goals or the multitude of them. Goals help us to get in tune with what we want to do in our life and who we want to be. Goal setting is a powerful tool which helps us to get where we want to be. Everyone sets goals – for the New Year, the next month etc. But do we follow them? Sometimes we know what we want and what should be done for this…but somehow we get stuck. Lack of time, energy or motivation…I think everyone knows this situation. Meanwhile, there are some tips which can make you to keep your goal in mind and certainly follow it until it comes true. Focus on one (or two) single goal. Maybe, you’re not satisfied with everything around you. But trying to change everything at once, you’ll end up failed and dissatisfied. When you have many goals, you waste the energy and don’t concentrate on any of them. You can pick several goals though, but only in the case they complement each other. For instance, if you want to start eating healthy, the goal of getting a good shape by working out will accomplish it perfectly. Divide the major goal on small ones. If your goal is big and can take years to come true, cut the long path to it into the sections, and focus on these intermediate goals. Thus, the progress won’t seem to you that slow. Reward yourself for accomplishing of each small goal to stay motivated. Take a look at your close surroundings. The people with whom we spend the most of our time influence our habits, manners of speaking and behaviour and even our thoughts and self-esteem! So, take a look at every person around you and ask yourself, “Do I want to have the same habits and pattern of thought?” If your answer is no, it’s not the best person to hang out with. Use the power of positive thinking. Maybe, you haven’t succeeded yet because you don’t believe that you can do it or think you don’t deserve it? It’s time for change. Believe that you can do it, that you will succeed. Be oriented on success, not on failure. Form the habits which will support your motion to the goal. If your goal is to write a novel, don’t wait for a mysterious muse. Find at least half of an hour in the evening for writing – just sit and start writing whatever you feel like. When you form the habit to write everyday and in any case, the achieving a writing goal will become easier. Track your progress and write down your achievements. When focused on the positive results, you feel uplifted as you realize you’ve already came a long way, and you won’t feel like stopping halfway. Writing down everything you achieved and learned (even if these results are small), you train your mind to be focused on success and don’t panic facing the circumstances any longer. Find the needed support. Even those of us who are pretty confident, are sometimes in the need of somebody who would encourage you to getting what you want and help to cope with difficulties. Share your goals with your friends or those who share your views. If there are many positive and kind people who wish you accomplishing your goals, you’ll be surprised how easy the way to it is. About the author: Melisa Marzett is a marketing specialist and a writer. She is a versatile person with many hobbies and interest, including dancing, reading and self-development. Contact with Melisa: Google+|essay writer. Meditation is important for two purposes: First, meditation can help you visualize success. Second, it will also let you reduce your stress. Stress is a proven killer. Keeping yourself rested and balanced is the key to reducing its negative impact on your health. The videos below will help you with meditation and stress relief.